Description	 MS in Greek on vellum, Byzantine Empire, 12th c., 2 vols., 209 + 234 ff. 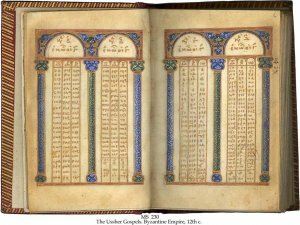 (complete), 12x9 cm, single column, (8x5 cm), 18 lines in a small, regular Greek minuscule with a few uncial forms, some sidenotes in red, rubrics and some capitals in gold, decorated headpieces in gold at beginning of each Gospel, 14 full-page illuminated canon tables. Binding	 England, 18th c., dark red morocco, sewn on 3 cords, decorative gilt borders, spines richly gold-tooled, red patterned endleaves, with Trinity College, Dublin's shelfmark "F.1". Provenance	 1. Thomas Goade (1576-1638); 2. James Ussher, Archbishop of Armagh, Ireland (1581-1656); 3. Elizabeth, daughter of Ussher, wife of Sir Timothy Tyrrell (1656-1657); 4. Trinity College, Dublin, "F.1" (1661-1702); 5. Sir Richard Bulkeley (1644-1710); 6. John Jones; 7. James Verschoyle, Bishop of Killala (1793-1834); 8. 1st Earl of Moira (d. 1793); 9. Francis Rawdon Hastings, 2nd Earl of Moira, 1st Marquess of Hastings (1754-1826); 10. The Hastings family until the death of the 4th Marquess (1868); 11. Philips, Nottingham, 29 Dec. 1868; 12. John Crichton-Stuart, 3rd Marquess of Bute, son of Lady Sophia Hastings, MS. 82 (1868-1900. ); 13. The Marquesses of Bute (1900-); 14. Sotheby's 13.6.1983:1; 15. H.P. Kraus, New York. 16. De-accessioned 2011 to the Green Collection, Oklahoma, MS 474. Commentary	 Archbishop James Ussher (1581-1656) was Primate of the Church of Ireland, and owner of ca. 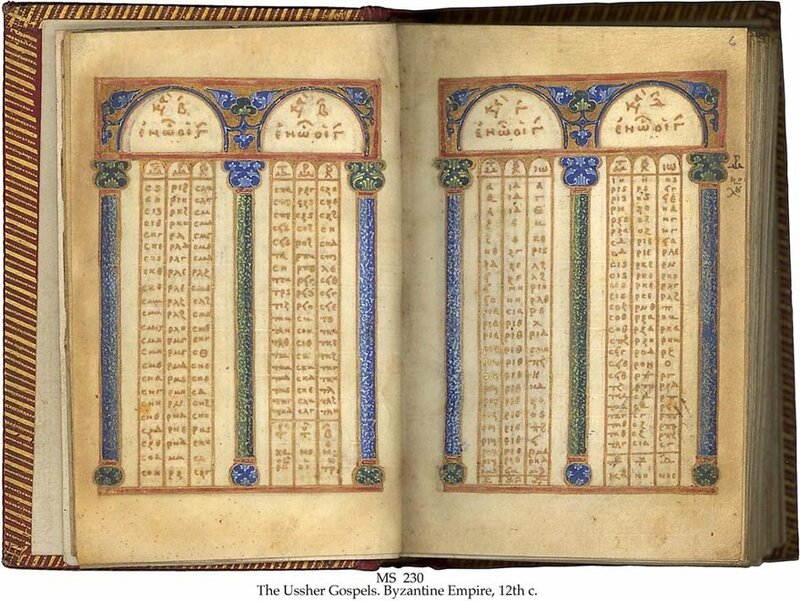 700 Biblical MSS. Other collectors, including Cardinal Mazarin and King Frederich III of Denmark, made attempts to acquire the library after his death. The collection reached Trinity College through the intervention of Oliver Cromwell and his son Henry. Sir Richard Bulkely, Fellow of the College, borrowed the MS from Trinity College, and died in 1710 without having returned it. A notable feature of this MS is the small size, as most Greek Gospels are great quartos. Only ca. 40 of ca. 2600 Greek New Testaments recorded by Aland are as small as the present MS. Diminutive books were for private devotional use. - Aland 64, text category 5 (Byzantine recension). Exhibited	 Oslo Katedralskole 850 år, Jubileumsutstilling 10. - 14. March 2003.